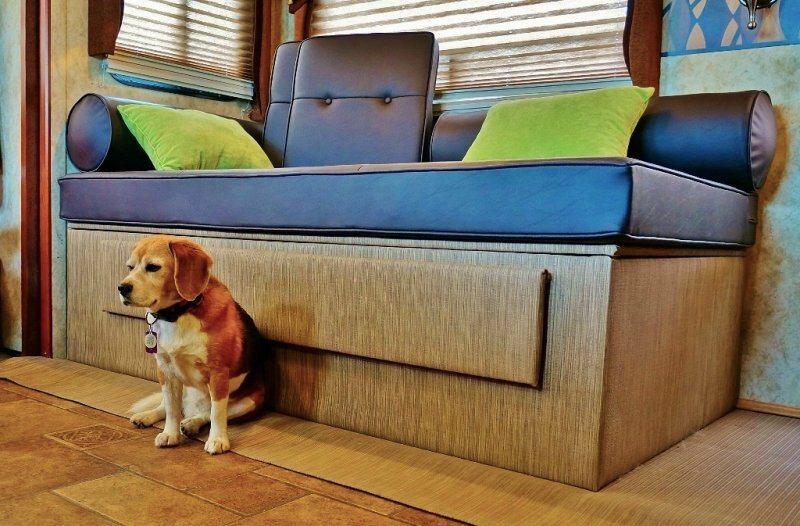 We love our little furry travel companion, Angie the beagle (Angelina Beaglina). 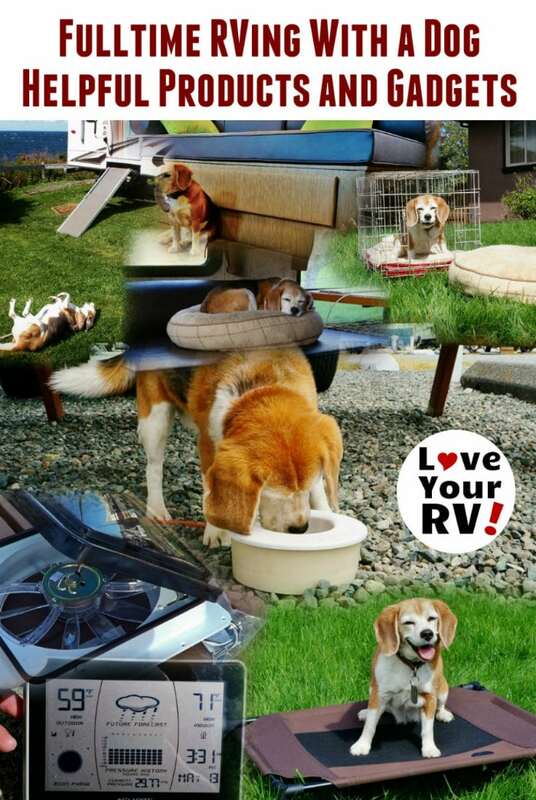 Angie and our other beagle Oscar, may he rest in peace, are a big reason we chose to travel by RV. We just couldn’t be away from our dogs for extended periods. 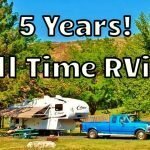 So in a big way, they are responsible for us falling into our full-time RV lifestyle. 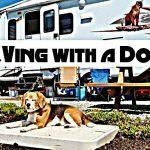 Over the years I’ve picked up many pet gadgets and products to help make RV life with a dog better. My aim is to keep Angie safe, happy and comfortable while at the same time reducing the mess and odors that come with having a dog. 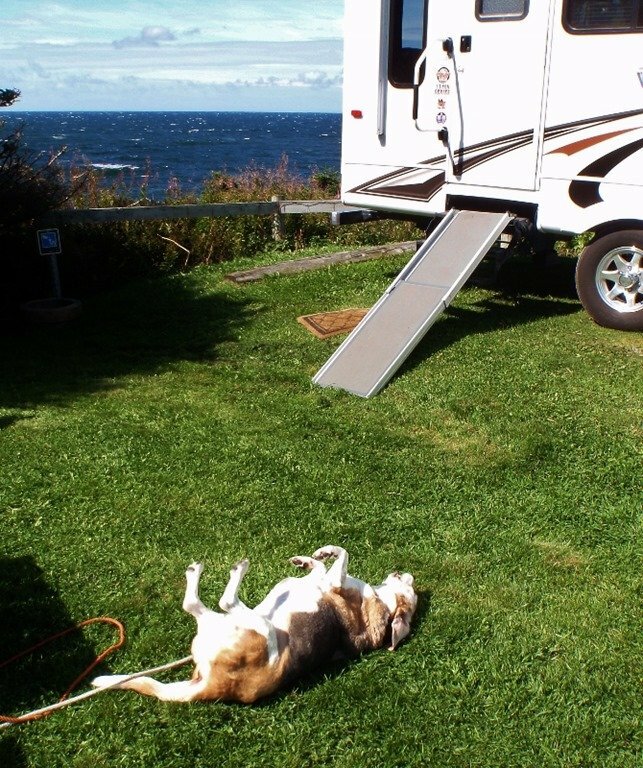 Hopefully, this list of things that have worked for us will give dog owners new to RVing some ideas to ponder. 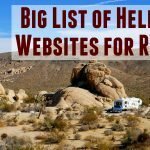 The style of wire kennel I use assembles without tools and has a flip up style door, so it’s not in the way inside the RV when open. Love the simple design. 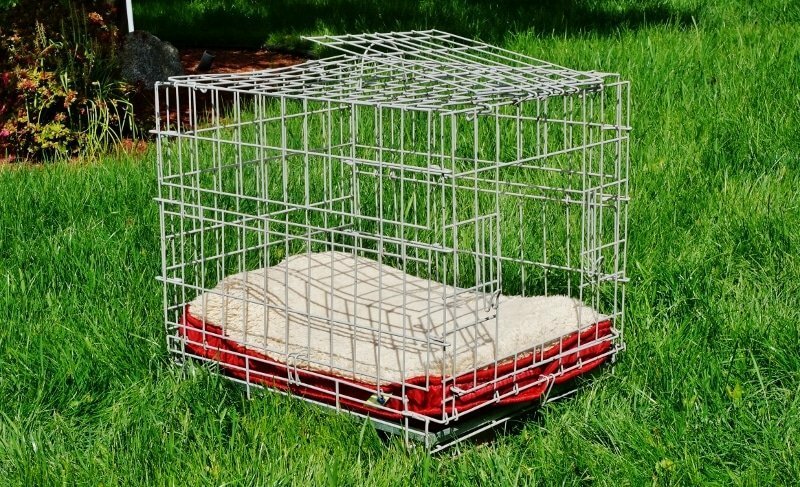 Note: Drawback to this style of a kennel is a dog could get their jaw stuck if they try and bite their way out. We dry camp often without the luxury of an air conditioner. 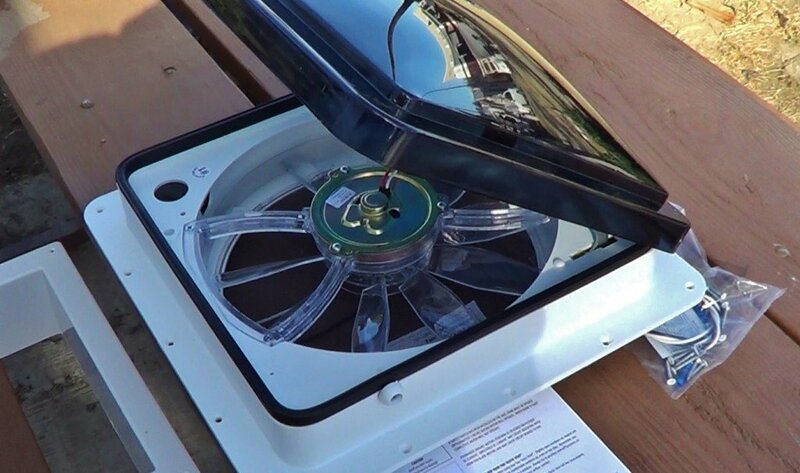 To help keep our furry friend cool on warm days, I’ve installed a powerful roof vent fan with a thermostat. 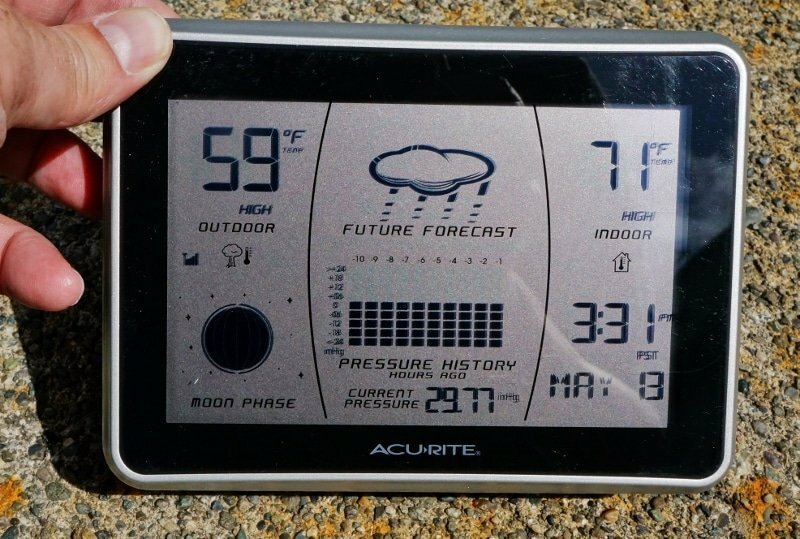 By closing up the windows and shades on the sunny side and opening up things on the shady side, I can keep the inside of the RV at close to outside ambient temperature. The thermostat comes into play when we are away from the RV. It will come on when the temperature rises and keep our dog cool. What I do is place her kennel beside an open window, and the fan creates a cooling breeze across her. 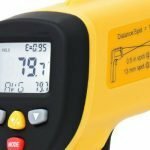 A wireless digital thermometer with max outdoor/indoor temperature recording is a cheap investment for our pets safety. 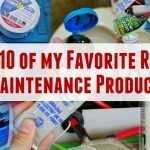 With it, I’ve been able to experiment and figure out how warm the inside of our RV will get depending on how we are parked in full sun. With knowledge gained, I can determine if it’s safe to leave our dog inside while away. I’ve found that if we are situated trailer nose toward the midday sun, the trailers internal temperature will stay within a few degrees of outside ambient temp. I have always been amazed that so many dog beds are hair magnets! I went through a bunch before coming across a couple that the hair doesn’t easily stick to. A square one for the kennel called a Top Paw and a round pillow type from Martha Stewart (may be discontinued I got both beds in a clearance bin at Petsmart). Both have removable zippered covers that can be washed. Also, the inside stuffing can then be replaced. I actually took one of my wife’s old Tempur-Pedic memory foam pillows and reused it inside the kennel bed. For inside the truck we had a local foam shop custom build us a vinyl covered foam mattress. It fits perfectly in the trucks back seat area when the bench seat is folded flat. The vinyl is easy to clean and doesn’t hold odors. 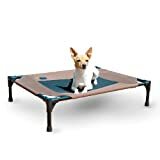 It has the bonus of keeping her cleaner and being off the ground helps prevent bugs and parasites from making a home in her fur. 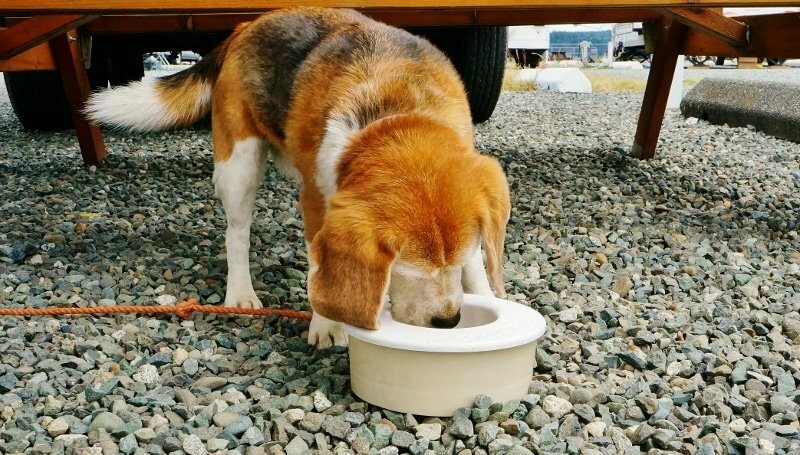 The water hole bowl is my favorite RV dog gadget. When traveling on long trips in the truck, I used to have to remember to give Angie water when we stopped for rest or fuel. Now I just fill up the spill proof bowl and leave it next to her in the backseat. It’s also ideal for the campsite; she was always knocking over her regular bowls. Swapping out the RV carpet and fabric furniture has made a massive improvement. We’ve enjoyed a dramatic decrease in stinky dog smells, and cleaning is a breeze. For the flooring, I installed something called Luxury Woven Vinyl used on boats. It’s waterproof, stain and smell resistant and looks great. I also build a daybed and had it upholstered in high-quality vinyl. Basically, we removed as much fabric out of the RV as possible. 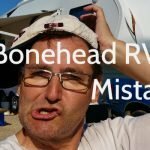 More Dog Relate Posts on Love Your RV! 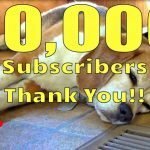 Twenty Thousand Subscribers! Thank You! 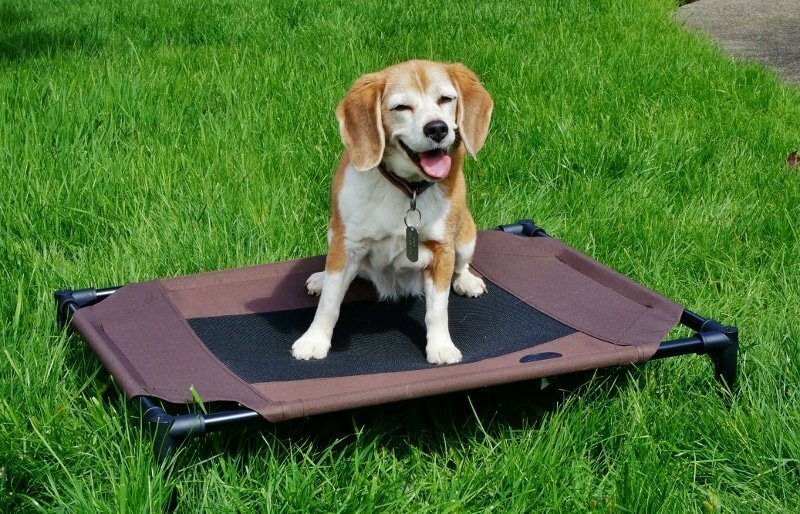 Beagle Tricks!